Last weekend Kyle and I traveled to Boston to attend the wedding of one of my high school friends to her college sweetheart. The wedding was on Sunday night (before Memorial Day) so the couple organized an afternoon and evening of activities for the younger wedding guests on Saturday. We were able to stay with another friend attending the wedding and hung out with her and other high school friends in town for the event several times during our 2.5-day stay. One of my friends and fellow wedding attendee graciously let us stay in her apartment, so our only cost was a small hostess gift ($18.27). It was way, way better than staying in a hotel because we got to spend the whole weekend with her and travel to everything together (it was very helpful to have a resident to drive or guide us on the T). The flights were the biggies in this category ($587.60), especially since the wedding was over Memorial Day weekend. We flew in Saturday morning and left Monday afternoon. In between, we took a few trips on the T ($20) and paid for parking at the Boston Common on Monday ($12). We also paid for parking at RDU for three days ($18). We had a mix of meals out and meals “in” at our friend’s apartment and one dinner was provided at the wedding. We ended up using cash for a lot of our meals, especially the ones where we split checks. We started the weekend with only about $40 in cash and immediately didn’t have enough. We had to borrow a $20 from one of my friends to pay for a meal and then hit up an ATM within 15 minutes (I love that we can use any one without fees – so useful when traveling) to pay her back and have something available for the rest of the weekend. I kind of forget that cash is useful sometimes, especially when hanging out with big groups of people! Kyle noted that Bostonians must be particularly critical of their restaurants, because we ate amazing food all weekend and yet all the restaurants had only 3.5 stars on Yelp! We bought a couple groceries for the weekend ($8.86) but my friend paid for most of what we ate. We had lunch at her place. 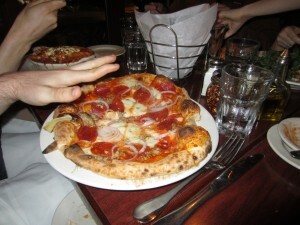 a “one-person” pizza so huge even Kyle couldn’t finish it! 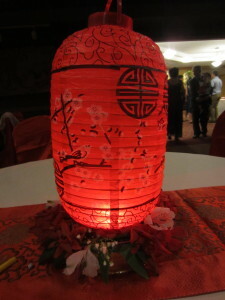 Dinner was arranged by the bride and groom as part of our Saturday afternoon/evening activities. We went to a wonderful Italian restaurant in the West End (really specific, right?) ($45). We momentarily had one of those terrible incidents where someone wants to split an enormous check 24 ways. I objected (over Kyle’s objections to try to restrain me) and the maid of honor ended up putting the entire tab on her credit card and then all 23 other people gave her cash for their parts of the meal. I certainly hope that worked out for her since I was the one pushing for not splitting the check equally. Before dinner we stopped in a coffee shop and after dinner we went to Mike’s Pastry (naturally) but we didn’t buy anything and Kyle got an éclair gifted from the bride’s brother. Is it weird that Kyle prefers éclairs to the cannoli at Mike’s? 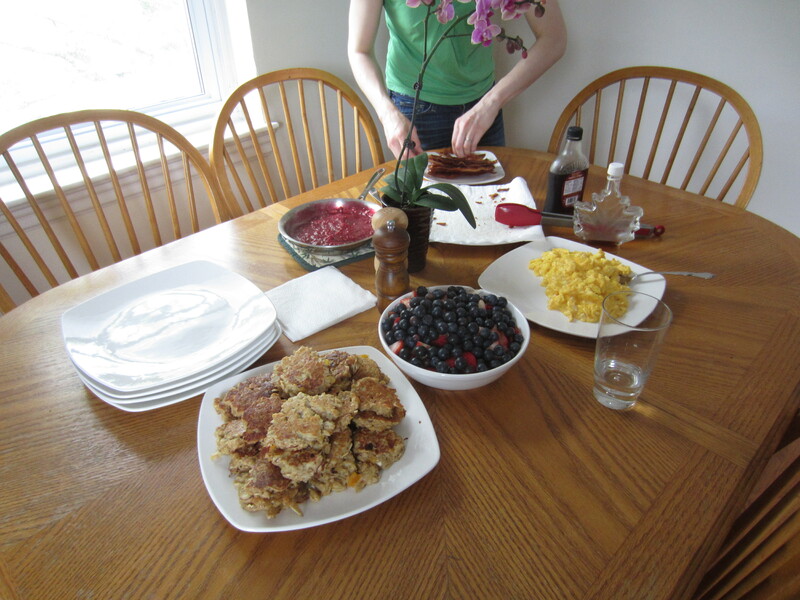 our brunch spread, including oatmeal-apricot-almond pancakes! Our hostess made a wonderful brunch for us and two other friends and we had dinner at the wedding. After the wedding we headed to a bar with the younger set of the guests and Kyle bought a beer ($6). We had leftovers/groceries for a quick breakfast and got lunch from a restaurant adjoining the Common ($18.46). All of our activities were free with the exception of the Duck Tour on Saturday afternoon ($63, student rate). We just spend the weekend with our old friends and getting to know some of the other wedding guests, usually over meals. The weather was rainy and very cold on Saturday and rather cold on Sunday, so when Monday showed up with beautiful weather we decided to spend a couple hours walking around the Common and Public Gardens with our friends. We spent what we always spend on a wedding gift, except we used one of my health insurance gift cards and a gift card from Christmas so we had no out-of-pocket cost. As always, we bought a gift from Macy’s, but only something that was on sale. All that adds up to $797.19, so we only spent about $200 on the trip above the price of the flights! I think that’s pretty good considering that we participated in all the activities and spent as much time with friends as possible. Of course our wonderful hostess made most of that possible – thanks again AR! What was your destination for your most recent short trip and how much did you spend? Do you use cash more when you travel? What did you do the last time someone wanted to split a check evenly? Do you visit Mike’s Pastry every time you go to Boston like we do? 12 Responses to "Mini-Vacation Financials: Wedding in Boston"
What did you get your host? I always end up buying enough groceries for the household plus me, generally wine too, and that sometimes ends up more expensive than a cheap motel with a basic snack for myself. Pauline recently posted..Friday recap, back home and a winner! The upcoming wedding we are going to will be or first trip back east where we don’t spend at least one night at my best friend’s pace. 1) because he lives in DC now instead of Philly and 2) because its his wedding that is the radon we are traveling. So for our night in Philly we are just greeting a hotel room. The west of the week, we will be starting at my parents house, like we always do. Edward Antrobus recently posted..I’m getting sick of this merry-go-round! That’s great that you are making it a longer trip! And it’s awesome that you usually get to stay with your friend. The couple who got married this last weekend doesn’t currently live in Boston so they were staying in a hotel. It would have been cool to be at the same place as them but waaaaay too expensive. Sounds about on par with our spending for wedding weekends for us – but when we have to get a hotel, it comes to right around $1000. Good for you guys! Yeah, I feel so grateful that we could stay with our friend. Hotels aren’t even particularly fun unless a whole bunch of friends are staying in the same place. You went on a Duck Tour!? I’ve always wanted to do that. It sounds like you guys did an awesome job of minimizing your expenses outside of the flights, but that’s just something that’s always going to be pricey. Sounds like a ton of fun memories, and of course, a wedding. 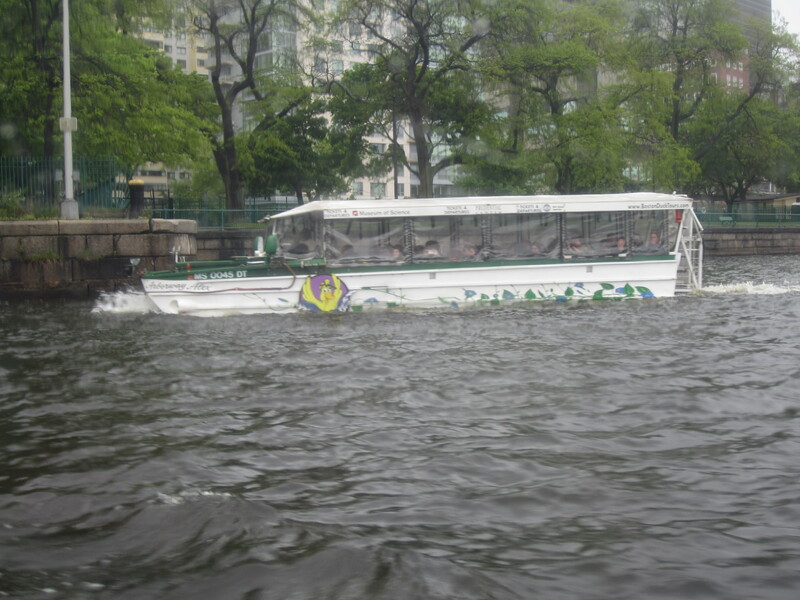 Yeah the Duck Tour was cool. It wasn’t the greatest weather so we had to have the windows up and it would have been much nicer with them down/no rain. Then again, if the weather was nice we probably would have wanted to be out walking! The tour guide was great. The weekend really was amazing and I had such a great time with my friends. I would like to post more pictures (the bride looked GORGEOUS and she had an incredible dress) but I don’t know how my friends feel about their faces appearing on the blog. 🙂 When you’re with wonderful people you don’t need to spend lots of money on entertainment! That’s awesome. That was so accommodating of your host. I’ll do that next time instead of going to a hotel. You didn’t spend much for the whole wedding trip. Good job. We are very blessed to have such generous friends and family. I love staying with the people I want to visit anyway!